The 119th Annual New York State Chess Championship, America's longest-running chess tournament, returns to the Sheraton Hotel and Convention Center in Saratoga Springs for Labor Day Weekend. This event has been held in Saratoga Springs since 1992, and it was also held there in 1945 and 1987. Last year, former U.S. Champion International Grandmaster Michael Rohde of New York City tied for First with Grandmaster Alexander Wojtkiewicz, former Champion of Poland, and National Master Ron Burnett of Highland Falls, NY. Rohde won the state title on tiebreaks. That was the fourth time that Rohde has finished First in this tournament. This year, Mike will be defending his title in a likely re-match against Wojtkiewicz. Over 200 players from throughout New York, New Jersey, Pennsylvania and New England are expected to turn out for the tournament, including some of the country's top players. Among them will also be several of the top youngsters in the U.S., including two 12-year-olds: Dmitry Schneider from New Rochelle and Samson Benen of New York City, the Number 1 and Number 5 players in the country under age 13. Schneider, a Chess Master, and Benen, an Expert player, have each defeated several Masters in rated tournaments. 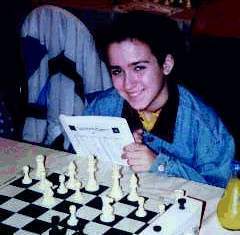 Many other young players are expected to participate as well, such as Laura Ross of New York City, the top-ranked 8-year-old in the U.S. There are six separate divisions in the tournament for all levels of players, beginners, intermediates and Masters, and the lower divisions in particular attract many young players. The total prize fund is over $11,000, including $1,200 and the Championship Trophy to the winner, as well as many more prizes for players in the lower divisions. Some players, adults as well as children, will even be playing in their very first chess tournament. All participants will receive national chess ratings from the U.S. Chess Federation (USCF), which are used in tournaments throughout the U.S. The main playing schedule begins at 1 pm Saturday August 30th and continues until Monday evening. Spectators are welcome throughout the weekend. In addition to the State Championship, Saratoga will also host the 6th Annual Action Chess Championship, at 7 pm Friday August 29th. Unlike the slower-paced State Championship, the players in the Action Tournament have only 30 minutes each for the entire game. As its name suggests, "Action Chess" is much more lively and fast-paced than regular tournament chess, as both players try to avoid using up their time before their opponent. The New York State Championship is the oldest annual chess tournament in the country, and is, in fact, one of the longest running annual chess tournaments in the entire world. The first New York State Chess Championship was held in 1878. For more information on the New York State Championship, the New York State Action Championship, and on upcoming USCF nationally rated tournaments, contact Steve Immitt, Tournament Organizer, evenings at (914) 569-9969. Additional information may also be obtained from the New York State Chess Association, at (718) 336-3988. For more information, beginning Friday afternoon August 29th, call the Saratoga Springs Sheraton Hotel, host hotel of the tournament, directly at (518) 584-4000, and ask for "the chess tournament." Here is more chess news: Sam Sloan's "Chess News"